Located on picturesque Lake Nottely, you'll stay in a comfortably furnished lakefront cabin that offers all the comforts of home. 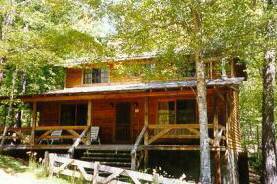 Whether you are planning a honeymoon, romantic getaway or a family vacation, Cozy Cove Cabins are the ideal location. Private, spacious porches overlook the lake for your enjoyment or curl up by a cozy fire to relax. Secluded in a private cove surrounded by the mountains, you will enjoy cool summers, colorful falls and holiday winters. 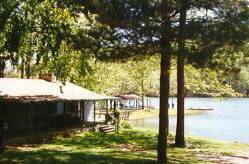 A covered pavilion on the lake for picnics and private boat docks for swimming, fishing and boating. Nestled within the boundaries of the Chattahoochee National Forest, Lake Nottely is breathtaking and approximately two hours north of Atlanta. We hope to see you at Cozy Cove! We love the peace, quiet, and serenity of the mountains and lake. It is truly one of the only places we can just relax. Blairsville is abundant in waterfalls, trout streams, hiking trails, mountains and recreational lakes. There is something for everyone. Two cabins to choose from.